Keep your eyes protected regardless of range conditions with Wiley-X WX Vapor Sunglasses. Shatterproof Selenite lenses meet GL-PD 10-12 MCEP, MIL-PRF-32432 ballistic, EN.166ft high velocity impact, and ANSI Z87.1-2010 high mass impact and optical standards. FOIL anti-fog and T-Shell coating work together to provide 100% UVA/UVB protection, guaranteeing you clear and distortion free vision. New WX LOX frame system permits quick and easy lens interchange. Low profile design allows for night vision goggle compatibility. Designed for maximum comfort and versatility these glasses are constructed with an adjustable nonslip rubber nose piece to fit any bridge size. Wrapback 90 degree lenses obliterates tunnel vision, giving you complete use of your peripherals. Compatibility with Universal Prescription Lens Carrier eliminates needs for additional eye protection. 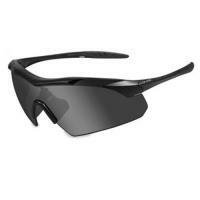 These ultra-lightweight glasses fit small to extra-large faces making them a must have for any shooting enthusiast. Meets GL-PD 10-12 MCEP, MIL-PRF-31013 ballistic, ANSI Z87.1-2010 high velocity impact, and ANSI Z87.1-2010 high mass impact and optical standards.